An Evening with Dirk Weisiger - "Leave Tomorrow" Get out and get going on your dream trip! 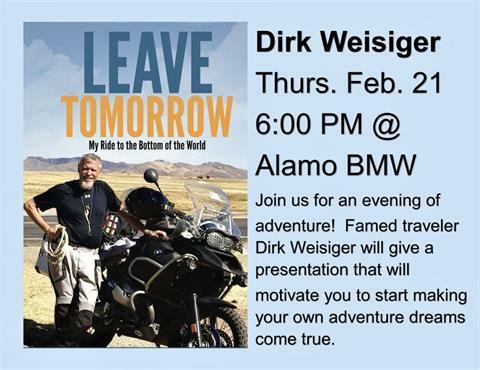 Overview: Join us on February 21 at Alamo BMW for an evening with Dirk Weisiger, author of the book, "Leave Tomorrow," which recounts his solo journey to Patagonia on his motorcycle. He will motivate you to pursue your adventure travel dreams now rather than later. Light refreshments will be served. Presentation starts at 6 pm so please be here a bit before to pour yourself a drink and get settled in. Please RSVP how many in your party will be attending to salesmanager@alamobmw.com. We look forward to seeing you here!